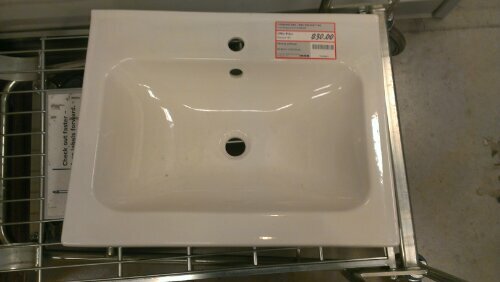 A clean and modern sink that will fit in my bathroom for $30? Yes please. It was a bit of an impulse buy, but I loved it. I brought it home and placed it in the garage until it was time to install the vanity. A few weeks went by and we tiled and tiled and admittedly put the project on pause a few times. Soon I realized we would need to get a vanity. 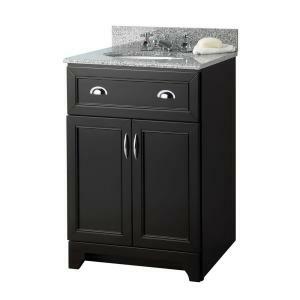 I measured the width of the sink and placed an order with Home Depot for this vanity for $128. I wanted patiently for a text from Home Depot to arrive to tell me I could come pick up my new vanity. As soon as I got it, I got Alex into the Sentra and we excitedly made our way to the store. We picked up the vanity (and some new house keys) and almost couldn’t get it into the car. As soon as we got home, I had to take it out and put the hardware on. Then I just HAD to put the sink on “for a dry run.” Guess what I didn’t measure? The depth of the sink. It’s about 3 inches too short. I could have cried. I really thought the bathroom purchases were done. Today is the day decisions are made. We already tried HOBO for a different sink, but they don’t carry any sinks in that size in white. Because they hate me, I’m sure of it. Tonight we try out the Habitat for Humanity ReStore. If we don’t find anything there then I am buying a generic white sink from Home Depot and calling it a day. When I first saw my powder room more than 2 years ago, I was disgusted. 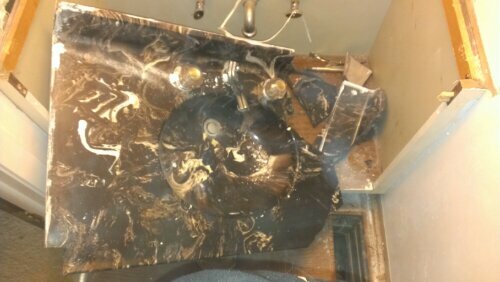 There was grime, old wallpaper, ugly laminate tile (not that all laminate tile is ugly, but this particular one was) and the most amazing and shocking faux marble sink I’ve ever seen. Even in a house with 4 other people I seemed to be the only one motivated to rid our house of its arguably most ugly eyesore. When my aunt offered to help me redo the bathroom as a gift, I was over the moon thrilled. She really knows what she is doing. She and her siblings completely rebuilt a house for my great aunt and uncle. So she came over one day, handed me a hammer, and told me to get to smashing. After one of the most liberating smash sessions I’ve ever had, we went to a local chain called HOBO (aka Home Owners Bargain Outlet) to find some tile. They sell short lots so everything is a good price, but what they have is what they have and other HOBOs don’t carry the exact same thing. She found the most glorious wall tile I’ve ever seen in real life. I love it so much I could hug it. Sometimes I go into the bathroom just to look at it. I chose the floor tile and I was a little worried that other people wouldn’t see how they went together like I did. We kept going full steam ahead while I inwardly doubted my choice. Then my aunt showed up with two little cups of grout and finished up the floor tile. That was when I knew for certain I had made the right decision and everyone agreed. It just works together. I was audibly relieved. Still riding the high of completing the floor, I decided that it was time to install the toilet that had been sitting in my garage for 2-3 months. 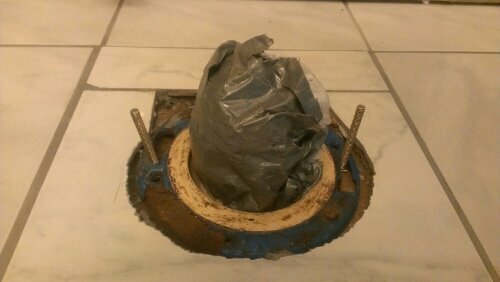 Removing a toilet is easy as pie and I’d been told installing one was just as easy. So Alex and I hauled that porcelain beauty into the house and unboxed it. Never in my life have I been so happy to see a toilet. 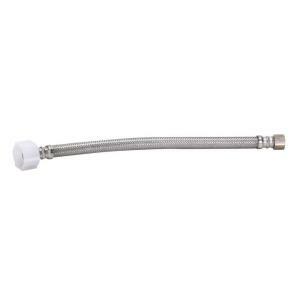 It came with instructions that, although poorly written (hose no include, anyone? ), guided us through the rather easy process. The most complicated process was probably getting the bowl in place and making sure the wax ring was sealed properly. We slid the bolts along the groove in the blue ring in the floor. These should guide the toilet into the right position. 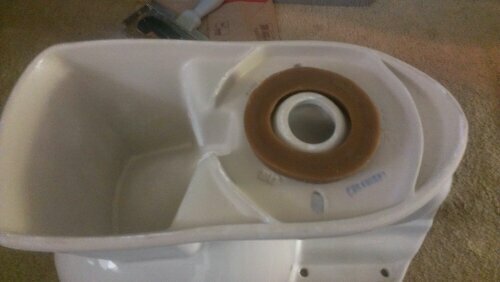 We also placed the wax ring on the bottom of the bowl and pressed it firmly on so it would stick when we turned the toilet over. This is probably the most accurate depiction of the grout color. I was really apprehensive about this because there is no way to tell if you did the wax ring correctly before you have completely assembled the toilet. Once the bowl was bolted to the floor, I did pour some water in to see if it leaked out anywhere, but it just stayed in the bowl. You are also supposed to do this so “sewer gasses” don’t leak up into your home. The rest was cake. We followed the directions and we were all ready to hook up the water and test it out when this happened. 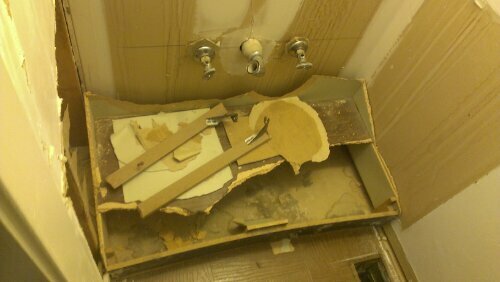 It claimed that you needed “no tools” and promised “no leaks” and it made good on one promise. 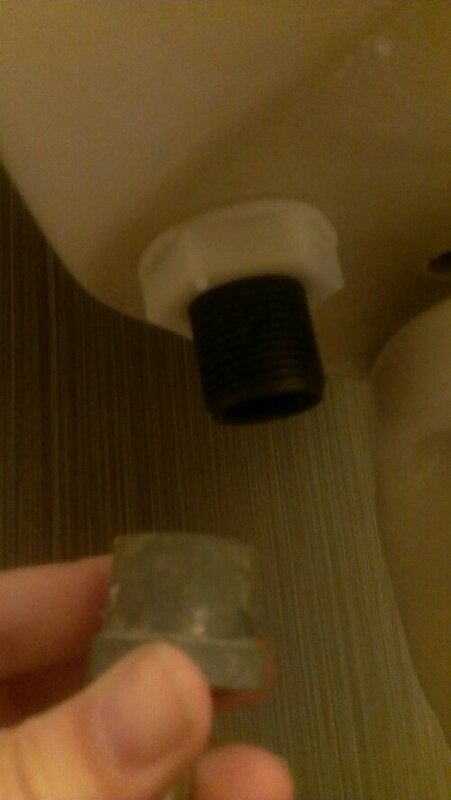 I did use a wrench to tighten the bottom nut, but so far there have been no leaks. I am not sure why, but I have been shamelessly telling people that I installed a toilet when they innocently ask me what I did this weekend. I’m sure all they think they’ll hear is errands or family stuff. 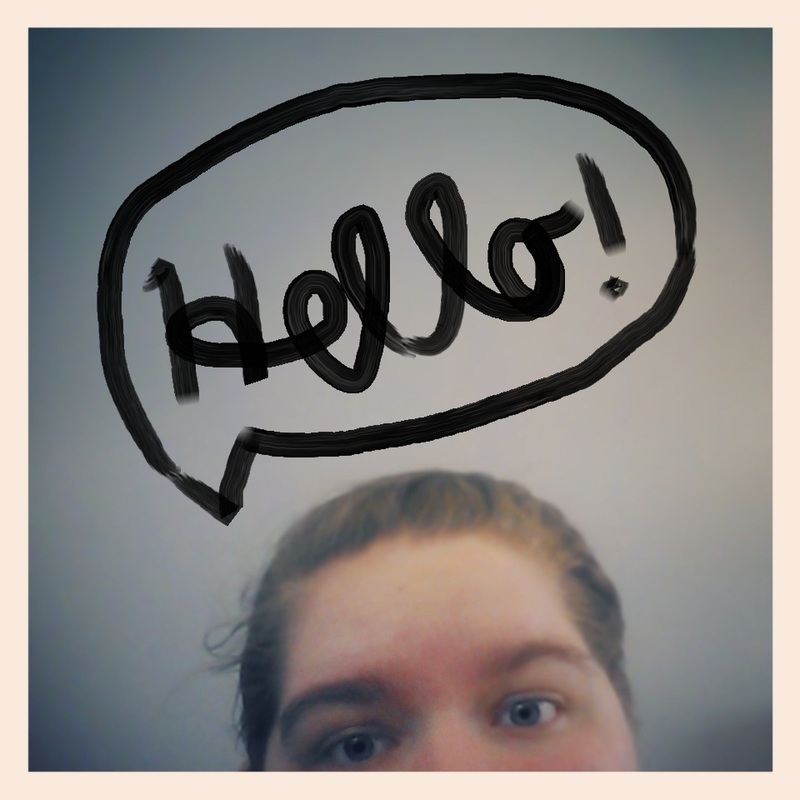 I can’t help myself. 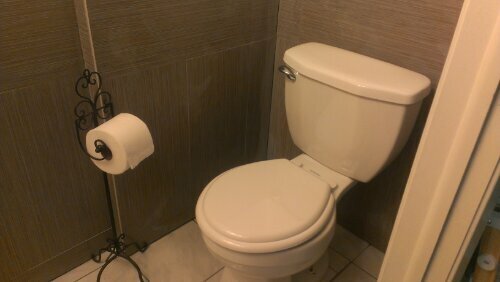 I almost whipped out my phone to show them pictures of my beautiful toilet. I didn’t show them, but I’m going to show you. I’m in love. I recently finished laying the floor tile in the powder room and I even learned how to grout! (My aunt has been guiding me through this entire project so I’m also working on her schedule) Taking pictures of the smallest room in the house is really hard so bear with me. All the floor tiles in place! I know it’s hard to see the difference in the pictures because the grout color seems so dark. This was taken while the grout was still wet and since it’s mostly dry now it has lightened up. In real life, it matches the gray tones in the wall tile perfectly and ties the wall and the floor together. Grouting wasn’t as difficult to do as I had thought. I imagined mixing up grout from a bag and having to subjectively guess what the consistency of peanut butter is. 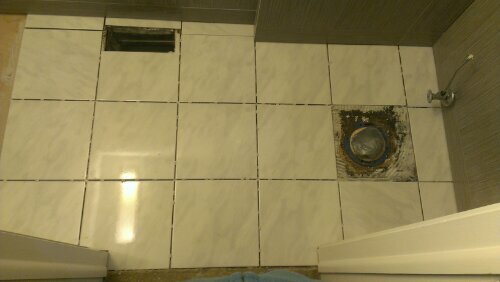 It was a messy job and the size of the room didn’t help, but with my aunt’s guiding hand, I got the grout in. Tonight Alex and I will be installing the toilet together which is like the blind leading the blurry, but pay that no mind! 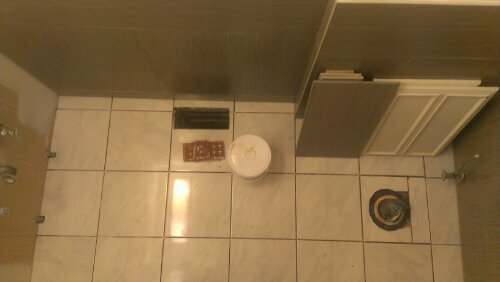 We have been without a toilet on the first floor for too long. Installing a toilet is supposed to be really simple so I am sure with a little Youtubing and calling my dad we will be able to manage. I’m feeling really confident with the choices I’ve made so far (vanity and sink are already picked out), but I’m not sure where to go with the paint color. I think a dark, moody greige would give it the look I want, but it’s such a tiny room with no natural light that I am afraid to go too dark. We shall see. I just want you all to rest with the notion that I won’t have to scale a flight of stairs just to visit the loo anymore.